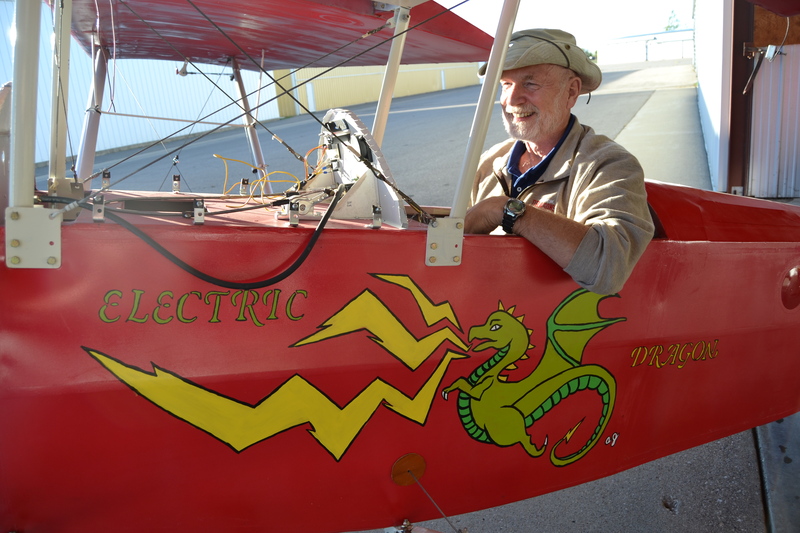 Physics professor Dennis Jacobs poses next to the Electric Dragon at the Detroit Lakes airport. His niece, a St. Paul artist, painted the dragon. If his latest project succeeds, the retiring MSUM physics professor of 27 years will be able to enjoy the landscape from an electric airplane he built himself. Jacobs, who helped start the university’s fledgling sustainability program, has spent more than a year transforming a lightweight 1931 Pietenpol into a plane that will run on lithium ion batteries and an electric golf cart motor. Along the way, he’s had students help research the best motors and batteries to use for the machine, which is housed alongside his two other planes in a hangar at the Detroit Lakes airport. For Jacobs, a degree-wielding rocket scientist, the project isn’t just a way to feed his backyard engineer mania; it’s a way to be a good environmental steward. In the carbon dioxide-to-oxygen converting woods, he’s built a home with local lumber that includes a large black panel to capture solar energy and an indoor pool to store it. Sometimes he tools around in an electric-powered Volkswagen bus he converted in an earlier project. Other people have built electric airplanes – NASA and Google teamed up for a 2011 contest – but Jacobs said that his $14,000 plane ($10,000 just for the batteries) is the least expensive he’s heard of. One of Jacobs’ students, physics and energy sustainability junior Ben LeMay, helped the professor research which batteries would be most effective. They settled upon lithium ion phosphate, LeMay said, because the batteries pack the most energy with the least weight. During a fly-in event at the Detroit Lakes airport this summer, LeMay helped explain the electric plane project to a curious crowd of about 400. He said he’d be sure to be there for the maiden flight of the Electric Dragon. So is Jacobs, although he insists he’s not going to take any risks with his life. At the Experimental Aircraft Association meeting in the terminal, group members talked planes over coffee and chicken. One member, 70-year-old Ted Kiebke, a career Navy pilot, shared his plans to power a plane with a Mercury outboard motor. “It’s quite the rig,” he said. Another member, airport namesake Doc Wething, said he never imagined people would be flying planes with boat or electric motors when he start serving on the local airport commission more than 50 years ago.